Well, here is another "long pose" from the last Friday session before Christmas. Since we are still in the "holiday season", I thought I could still post a pastel of an elf. Again, this is my multi-media process that I am working on - first the sketch in one colour of hard pastel on watercolour paper. Then colour washes with three primaries in acrylic. Blow-dryer--- then apply acrylic pastel ground medium... this is quite gritty. Blow dry again -- then work in pastels. Each time is a little different - not just the model and the pose, but also how I mix and blend the paint layer. The pastels are different on a coloured surface, of course, and different as the under-colours vary. I'm enjoying trying out different effects each time. I'm not sure where I am going with this, but I just got some more watercolour paper and I intend to keep working on more figure drawings with this technique. Another bonus is that sheets of paper don't take up a lot of room. Labels: acrylic ground for pastels, figure drawing, mixed media with pastels, more "long pose"
Well, here is the painting with the most red I have ever put into a painting! On the other hand, I have never painted a poinsettia before. This all started as I was mulling over what paintings to use on my Christmas card. When I was given a poinsettia, it seemed a natural to have it for the cover painting- the only problem was that the painting had not been painted. I also had the inspiration of two trial tubes of "cadmium red medium" from Liquitex. They were just marked "1" and "2" and one was truly cadmium-based but the other is a new development that eliminated the toxic cadmium and was said to be a very durable replacement. I tried out the two and got some friends to try too - and we could not tell any difference in how the paint handled. This is a terrific step forward for good opaque reds, orange, and yellows in eliminating toxins. Paint manufacturers are always working for improvements. When Van Gogh painted his yellows, they were not permanent and dis-coloured over the years. Cadmiums were a "permanent" replacement but now they will be replaced too. This has happened with many colours over the years- arsenic is no longer used in greens and expensive lapis-lazuli was no longer needed when ultramarine blue was developed. Liquitex, interestingly enough, was the first developer of acrylic paint for fine arts. It was developed after latex paints came into use for house paints... and that, of course, was so toxic lead could be eliminated from house paints. So, bit by bit, some toxins are being eliminated. So I'm late with snail-mailing cards but it was fun to do this painting. ArtRich is on display in Richmond Art Gallery until the end of the month. I have "Sandpiper Time" on show as it was accepted into this exhibit. The red in it is just a very little bit- the Canadian flag and its reflection. 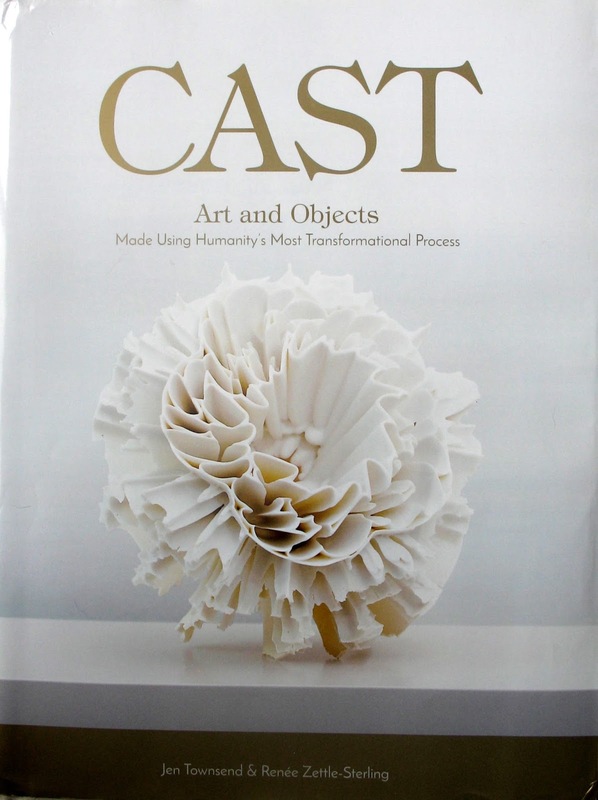 At first glance, Cast looks like one of those coffee table books- large and beautiful but not much more. 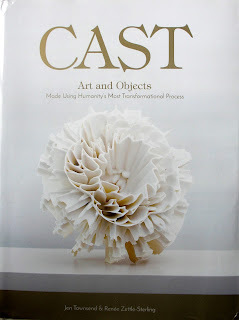 However, Cast goes far beyond being beautiful to being totally interesting and informative. I'm a fast reader usually, but I've enjoyed slowing down, lingering over illustrations and thinking about casts in a way I've never thought before. The book covers both fine arts and every day life. The art of casting, pouring material into a mold, dates back to antiquity but modern manufacturing casting has changed our lives- toilets for modern sanitation, bricks for construction, mass-produced plastic toys- these only touch castings influences. Beautiful photos illustrate ancient and modern masterpieces. A chapter on jewellery illustrates pieces far beyond what the reader is likely to see in ordinary circles-"from wearable to conceptual". This is the first-ever in-depth resource about casting- truly a book to enjoy over time. Back in my fabric-art and doll-making days, I did a little casting- but the authors tell us that if we have ever made ice-cubes, jello or muffins, we've all done casting. I took the above photos, but you can see more about this book at www.castartandobjects.com I certainly recommend this as a real treasure. Shipyard" was selected. We were asked to write statements for a binder so that people can see where the paintings fits into the celebration of Canada's 150th. This is my statement for this painting " "Sandpiper Time" is about what changes and what endures. Every September, the sandpipers come to Britannia and here they sit on a floating log and on a piling. They were here long before settlers and the great salmon runs of the past - for which the remains of the piers are a mute testimony. Will we protect the environment so that they can always return?" I made a point of making the paint thicker on the pilings above the waterline while the reflections are thinner paint. I think the dimensionality adds to the interest of the painting. Now that we can get the painting room in the daytime (which we can't in the summer, due to kid's classes), we are back having long poses again. Most people are painting although some are drawing, and I am back to mixed media. I had a rough grey paper for this ... now I can't remember the name of the paper but it is quite rough and has flecks of something that looks like bits of straw in it. I started with a drawing in black conte' and then used pthalo blue, alizarin crimson and arylide yellow acrylic in some washes. After using the blow-dryer, I painted on acrylic gel for pastels and then dried that too. Since the paper was already quite rough-surfaced, I then had a nice gritty surface to work on. Giving created the pose from inspiration from a statue who was part person but also turning into a fern and returning to the earth. The statue's hands had already melded into fern fronds. So it was fun to have this different idea. I worked a bit of green into the skin tones. I used some powdered pastel, applied with a sponge to get a base going as both soft pastels and harder pastels tended to sit more on the surface of the rough paper. However, I also liked the effect of the upper layers of pastel on the rougher surface. I think I only have one more piece of this paper but I may do a search to find some more. I recall that it did come in different colours. So, what should I call it? 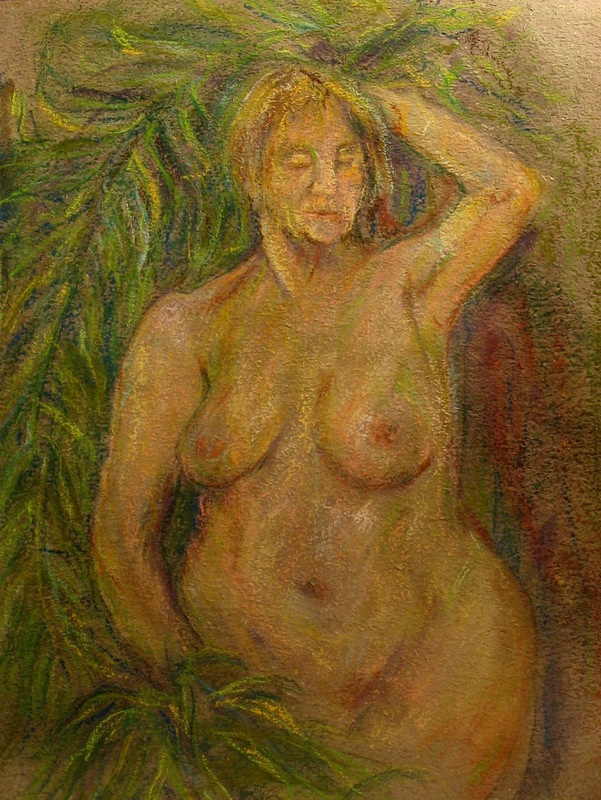 Lady of the Ferns? This shows the set-up we had for GuessWho? on November 4th at the Pioneer Church at #3 and Steveston Highway. We set up grids and hang all the 10x10's on both sides of the grids. We had 137 paintings and sold 52 - all from 10 am to 3pm. There was a terrific selection and we made $2350 for the Richmond Food Bank. We also had a lot of fun so it was a great success. If you didn't make it this year, mark your calendar for next year when it will be November 3rd. You'll never had a better chance of getting terrific original art for only $100!! Something different today- I didn't paint this and I'm not telling who did - but this lovely 10x10 painting could be yours for only $100 at this year's GuessWho? sale... and then you will find out who the artist is. The sale is this Saturday, November 4th from 10 to 3 at the Pioneer Church at the corner of #3 and Steveston Highway-- the little church on the grounds of South Arm United. $50 goes to the artist -- so you see the artists are making a contribution too -of time,materials and talent. Then the balance goes to Richmond Food Bank - which is a very good cause especially with the colder months coming up. There are 132 paintings to choose from this year. They include paintings by artists whose works sell into the thousands - and also works by students of Steveston/London Secondary and some of these may be worth fortunes too when the student artists become famous! Since they are all the same size and don't need framing, you can start to build up a collection. I have some sitting on strips of wood painted the same colour as the wall. That way it is easy to get them at the same level without bothering with wall hangers. A gallery wall is a lovely way to enjoy a variety of paintings. Often I deliberately do something a bit different - so my challenge to you is to guess which ones I painted this year. Richmond Artists Guild planned our usual contribution to Cultural Days - which was September 30th-by having a model and the public could either watch or join in. We decided to have a bit of a twist by having our model pose on her motorcycle. One good thing was, when the model took a break to stretch and walk around, the motorcycle stayed put so some more work could still be done.Some were painting on canvases but I decided to work on pastels and I chose a neutral grey pastel paper. Pastel paper is two-sided. One side is smoother and the other side has more of a grid surface to hold the pastel pigment. Good quality pastels have more pigment than cheaper ones. Pastels come in soft, hard or even pencil forms. There are also very soft powdery ones that come in little cases much like the compacts girls used to carry to powder their noses. In fact, this form of pastel is applied with a sponge - and make-up sponges are cheaper than the ones sold for the same purpose in art stores. Pastels have to be kept sorted to like colours so that they don't rub off against each other and become grubby. One of the joys of using pastels is that the colours have a lush richness to them that can be a delight to apply. Well- it rained on our Cultural Day, but we were under a canopy and managed to finish- but I bet our model would have been happier indoors with a heater. 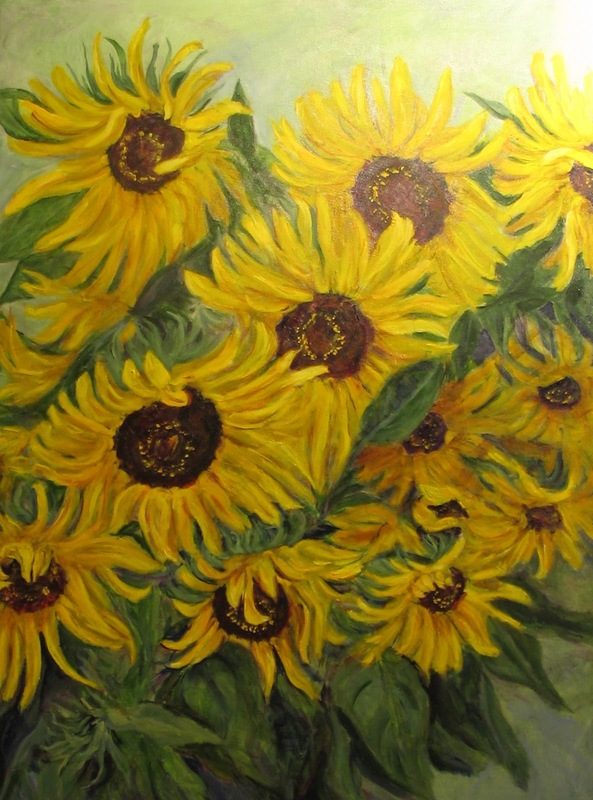 Here is the 2017 sunflower painting. I can certainly understand Van Gogh's fascination with sunflowers- somehow they are always a bit different and always interesting. Plus there is the challenge with working with yellow. Yellow pigment tends to be on the weak side - no mater what the medium it is in. I often under-paint with white so the yellow can then show to its best advantage. Today's paints are permanent but Van Gogh had trouble with his yellows because they changed with time and became more green- thus making a challenge for restorers. The question being - not only what to use - but what shade was he actually aiming at? It is also a challenge to work shadows with yellows and not have them turn muddy, I like acrylics as the shadows can be done with glazes and it keeps the colours fresher. 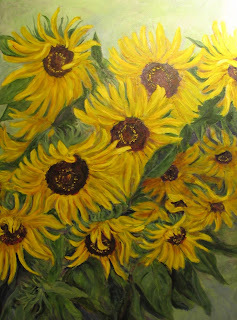 No vase in this one but there is in my sunflower painting in Mila's online gallery at www.va-fair.com Van Gogh signed his name on the vase- so, as a tribute to him, I signed my name on the vase too. There are actually several different yellow paints in this painting- not only Cadmium Yellow Light, Medium and Dark, but also some Azo Yellow and a few more! Tjen there is Naples Yellow in with some blues and Sap Green to make the greens. Colour is fun! This was a different subject from a day out at Iva's garden. 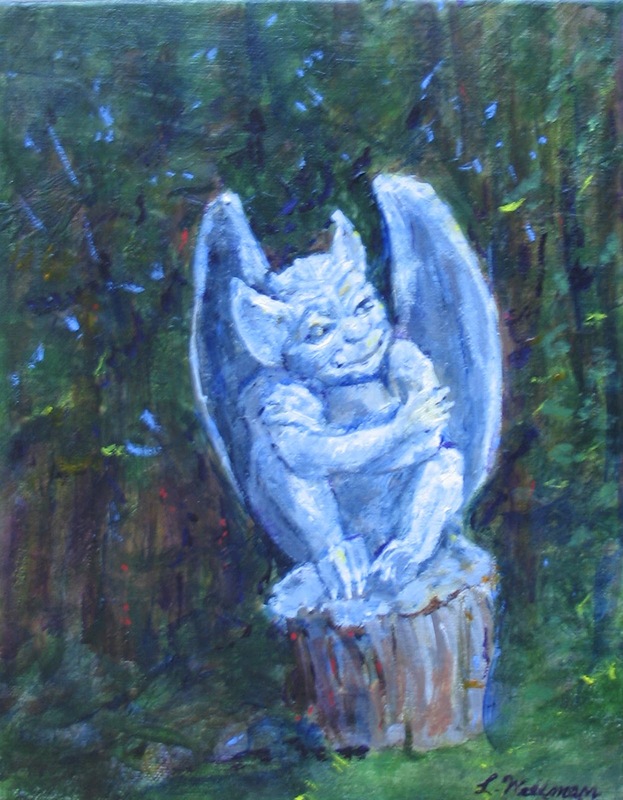 Dave and Iva have a collection of statues and gargoyles that inhabit their garden. 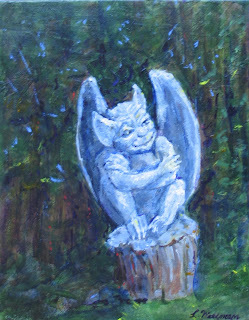 I thought this little fellow might be fun to paint because he has a mischievous expression...then it was too light behind him (in reality) so I had to darken down the trees to make the painting work. . He does look like a statue here however and I wonder if he should be "revisited" as a "live" imp? At the moment, he will be left as is- a painting that records a nice day out with friends. While not a great summer because of forest fires, this summer has been great for good-weather Tuesdays and Men in Hats have been busy painting in various locations around the Lower Mainland. A couple of weeks ago, we went to the north end of Trout Lake - aka John Hendry Park. I found a good spot under the shade of a big tree and elected to paint this scene. The strips of light and dark appealed to me - as did the green canopy. It is a small canvas -just 8 x 10- So I mostly finished it on the spot. Hopefully, it captures the mood and the freshness of the day. It is always a pleasure to be out with a bunch of other artists. We are also fortunate to have a great selection of places to paint. We will be painting through to mid-October and post the locations on the Men in Hats website so that other artists are welcome to join us. No instruction - just bring paints and a lunch. Men in Hats had a fun day last Tuesday when we went to my trainer's house. He has a great "fifties" collection . The '56 Bel Air Chev, a '56 Ford truck and an old motor cycle were all set up for us ---even with a couple of mannequins. (Great models- they never moved!) The car hop was on roller skates and had a tray with some delicious looking milkshakes - too bad they were wax! This is an acrylic on canvas painting. It was a challenge getting the chrome shiny enough. Also, I wanted to indicate the Chevrolet "V" and the chrome name on the side - without painting it so exactly that it looked like an advertisement for a magazine, rather than a painting. The "Drive-In", of course, is invented. I've never really done a car "portrait" before- but it turned out to be fun as well as a challenge. The tail fin of this car is going into another painting - but more of that later. 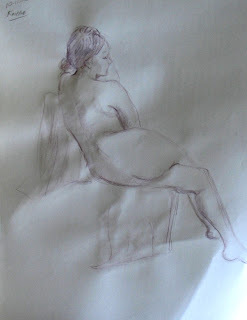 Life drawing- did it make a difference? Did it make a difference? I don't see any *huge*difference after reading the perspective book. However, I was perhaps more aware of the foreshortening challenges. These were all done with a brush-pen and then coloured pencil was added - only without the "pencil" part. These were Prismacolor wooden-less blocks - looking just like hard pastels in shape but being made solely of the core material of a pencil crayon. I was trying deliberately to think of connecting curvilinear lines -without marking them on the page- and drawing quickly with the brush-pen. The top two figures were 1 minute each. 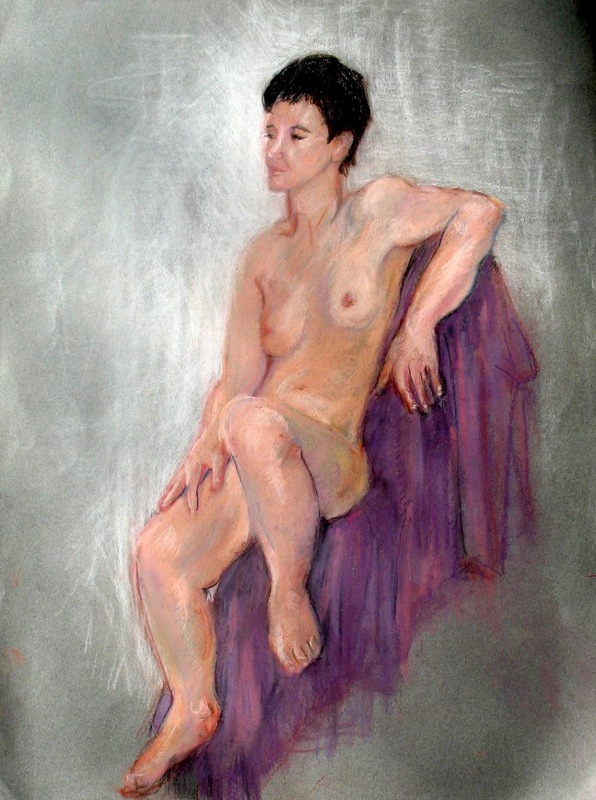 The bottom drawing was a 20-minute pose and I did add some colour while the model was posing and then added more later, especially in the background. so far, I have left the sticks in their square shape , but I'm toying around with the idea of hand-sharpening- probably with a knife- one end. The shape does allow a quicker approach to noting light and shade areas. Working with Graphitint pencils resulted in more delicate drawings - as seen in a recent post- but I am currently enjoying the stronger contrast with the brush-pen as well as colour again. The human body is always a challenge to draw since mistakes are so easily seen. Yet, there is something personal about each artist's approach. I think there is more feeling that a photo would show. 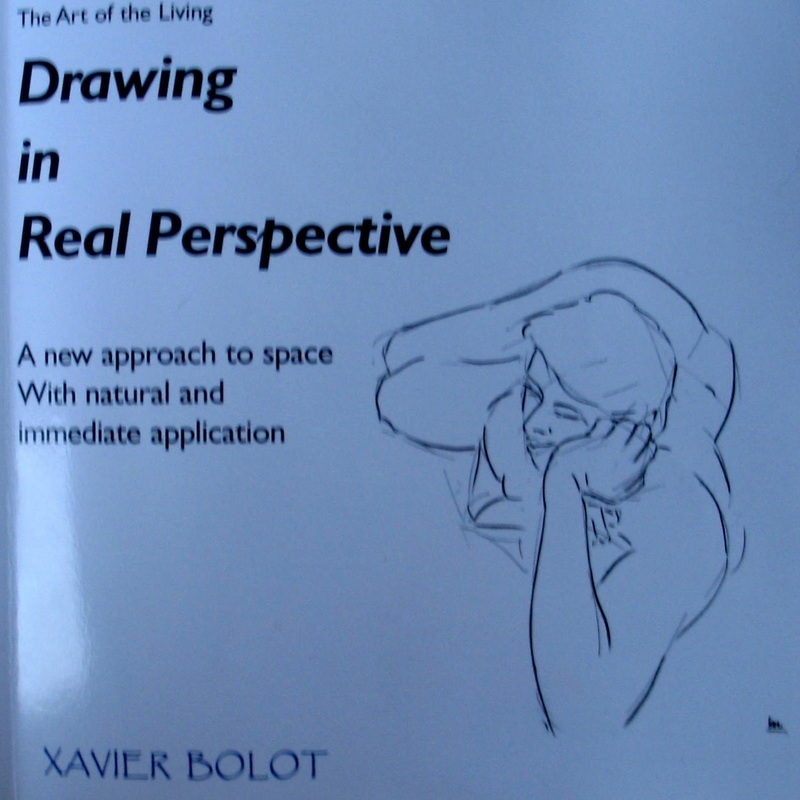 Drawing in Real Perspective by Xavier Bolot. 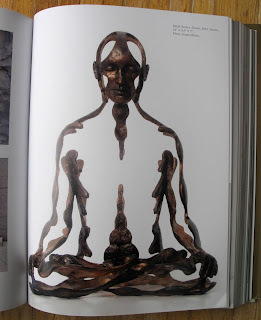 Perspective is often a challenge for an artist so I approached this book with a great deal of interest. However, I found the book rather over-whelming as it is a very verbal explanation for solving a visual problem. I haven't thought about trigonometry since high-school so I found wading through pages of mathematical explanations a bit heavy going. Ultimately, the explanations make sense and the figure drawings offer worthwhile guidance. The Greeks used curvilinear perspective. A temple viewed from a distance is seen as straight, friezes on a column appear to be the same height when seen from the ground because curves characteristic of our natural vision perception have been utilized. Linear perspective was developed in the Renaissance but it doesn't work for very wide landscapes or for close-ups with models. One section shows some errors of the "old masters". Mantegna's "Dead Christ" looks strange because the foreshortened proportions are all false. Caravaggio's painting of a man with outstretched arms in "Pilgrims of Emmaus" has the hands all wrong. The left hand is closer to the viewer and is acceptable as is - but the right hand- extended away- has been painted the same size and so looks enormous. Curving guidelines are very much needed to check on model proportions. I found this section the most interesting and worthwhile. 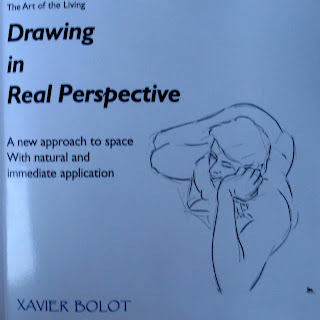 I found this book thought-provoking about perspective but I also concluded that drawing what you actually see, applying the principles intuitively, while being aware of common errors is the most helpful advice. I can see myself looking carefully at angles and proportions but not getting too mathematical about it. This was worthwhile reading. I am simplifying what I am carrying around, so I decided to work in black and white on grey paper again for our plein air day. We were on the south arm of the Fraser, with the Miltown marina on our other side. This is looking towards the airport- on the right. I thought of doing some of the airport buildings but then decided that this view looked quite calm and rural. Who would think that there was an airport to the right, a mall to the left and airplanes heading in to land just overhead? It was just a matter of being selective. Working in black and white is a good exercise as tone values are very important even when you are painting in full colour. It is easy to get carried away with the excitement of colour and forget that the tone values are important in making the composition work. I'm probably going to do more of these on our Tuesdays and I'll probably show them as a group next DoorsOpen. I only use charcoal pencils as I was working fairly small. Still, it is possible to try different ways of making marks - like brushstrokes vary in a painting. I'm not sure where all this is leading, but I'm enjoying the journey. This was our last Friday "long pose" as we can't book daytime space once the schoolkids are out and kid's classes are running all the time. I decided to keep it simple and draw in Chinese ink. Paper does make a difference. The top drawings were warm-up poses of one minute each and are drawn with a Chinese brush on cartridge paper. The brush and ink has a lovely flow for doing the quick sketches. The next shown was actually the third from the long pose and I had shifted my position a little. It is done all with a brush and ink on "terra-skin" - the paper that isn't really a paper as it is actually made from stone. The ink wash puddled a bit more as terra-skin is not as absorbent - so it took longer to dry. I don't really like the mottled effect that results. The next drawing is on vellum paper - a bit creamier and thicker. The washes sunk into the paper quicker so there was more control. The last one is also on vellum paper and there was some pen used as well as the brush. These were all part of a roughly three-hour session - which means a little over two hours of actual drawing time. Although we can't book daytime sessions during the summer, fortunately we still have our Wednesday night Life Drawing. It is not likely that I'll work in Chinese ink then as we are more crowded and I need a bit of room to work with ink. Labels: "Long Pose" life drawing, Chinese brush and ink, Chinese ink on vellum paper, Ink reaction on terra-skin, quick sketches with brush and ink, Terra-skin "paper"
Well- maybe not"shades of grey" = that was just to get your attention. There is only one grey - and that is the paper. The rest is black charcoal pencil and white charcoal pencil. Men in Hats were drawing and mostly painting at Harold Steves' farm but I decided to keep the transport simple and just work on a drawing. This building appealed because it was very dark inside but you could see the light coming through from two back windows. I also thought the wire fence would be a challenge. It is interesting to just work in tonal values for a change - and not think about colour at all. I may do some more along this line-- much easier than taking paints - and right now, I don't have a good packable easel. My good old reliable one packed it in the other day. This time, in a week, DoorsOpen will become "doors closed" and it will be over for another year. So... don't miss it! I will have the full series (well all I am doing for now - who knows if I will return to the theme?) of "City Evenings" - some have been posted on blogs - but there are some that haven't been - so come and be surprised. June 3rd and 4th, 10 am to 3pm. Brochures available at various city locations- community centres etc. There will be a piece in Richmond News and you can also go to the city website www.richmond.ca/doorsopen I have a draw for a free painting. I thought I would post something different than another "City Evening" this time- but it is also recent. This is "Autumn Hike"from the Mount Baker area- getting towards the end of last year's hiking season. I have a request in for more hiking photos this year- especially waterfalls- so we will see. I used to enjoy hiking - although I never did any overnight hikes. Autumn colours somehow seem especially amazing up in the mountains. I still remember a hike up Mount Arrowsmith when the whole scene couldn't have been more lovely- like it was planted by a Master Gardener. Well, maybe it was! I'm getting ready for DoorsOpen on June 3rd and 4th so there were a few paintings left to be wired. It is not my favorite job - so I'll take any help I can get. Digby felt he could make his contribution by sitting on the canvas...fortunately on the back and it was face down on a towel. Somehow, even with his help, the paintings got wired. Digby is looking forward to being doorman and welcoming all the visitors. 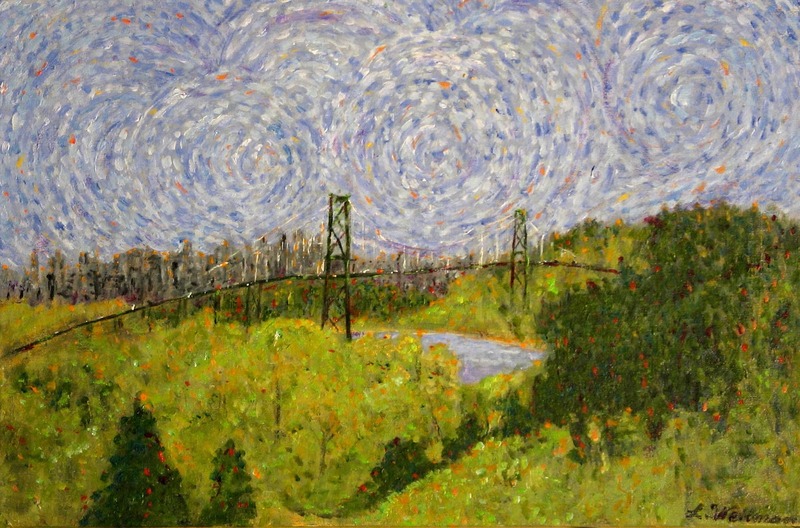 I just got the notice that this painting of Lion's Gate Bridge went for $900 at the Daffodil Ball- the fundraiser for B.C. Cancer Society. I'm glad it has gone to a good home - and glad that it helped raise money for a good cause! This was painted last year after Men in Hats had the opportunity to paint on the deck of a lovely condo above Park Royal. I painted a smaller one - which I have since turned into "Van Gogh Visits Vancouver" - and then painted this slightly larger- 16 x 24- one in the studio. This "Van Gogh Visits Vancouver" version will be at DoorsOpen. ( June 3rd and 4th from 10 to 4 when I will have an open studio) It is 12x18 - and will be *much less* than $900! This one is "Seven-thirty" from the "City Evenings" series. Time for a walk with the dog to the corner store, from this winter evenings series. I just used it for my May newsletter. ( Question - how did we get to May so soon?) As I said in my newsletter, I was definitely thinking about Edward Hopper when I was doing these paintings but I wanted to put my own spin on the idea and have present-day time too. I started all of these paintings with a dark under-painting, then used white chalk to draw the shapes. Then I used Transparent White over the chalk. I wanted a softer white than Titanium. I then worked at mixing both cool darks and warm darks for the painting. Some of the lights were warm, but fluorescent lighting is cool. There is a fair bit of Alizarin Crimson used in the brick building. This is from last Friday with our smaller group for "Long Pose". It works out to around 2 hours drawing (or painting) time - allowing for breaks for the model and time to set up the pose and lighting. This piece is done with mostly soft pastels or grey pastel paper- no mixed media this time as we were in a smaller room and there wasn't comfortable space to get up, apply paint, pastel gel etc. We have a sturdy step stool now and with sufficient padding on it, it makes something a bit different for the model to perch on. So, we get away from the flatter "girl in chair" type pose. My position meant that I had a nice angular view - and a bit of challenging foreshortening. "Foreshortening" just means perspective as applied to the human form. If we had more storage space, we could have a chaise lounge or other things that would give an interesting set of options for poses - but we don't. The step-stool has the virtue of folding flat for storage. Some people call pastels "paintings"but I think of it as more of a completed drawing since there is paper left uncovered. Some fast painters can complete a painting in this time, but I don't paint that fast so I was happy to be using pastels for this . 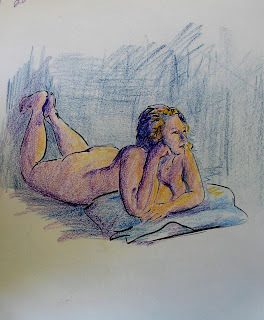 I am working a bit smaller and in neutrals for a bit in life drawing. I'm using Derwent's "Graphitints". These are graphite pencils so you draw - and erase- just like ordinary graphite pencils. The graphite is tinted somewhat so there is a subtle colour, Then, when a wetted paintbrush is applied, the colours become more intense and will wash out a bit to create shading in the drawing. This is not a very heavy paper so there is some warping of the paper- but the effect shows. This was just a ten-minute pose but I thought it turned out reasonably well. I'm enjoying having a go at smaller, more controlled drawings - at least for a bit. When this sketchbook gets filled, I may go for Inktense or water-soluble wax crayons for wilder colours and less control. I find it is good to change what I'm drawing with every so often. Of course, every other Friday, for Long Pose, I'm continuing with mixed media - for now, anyway. 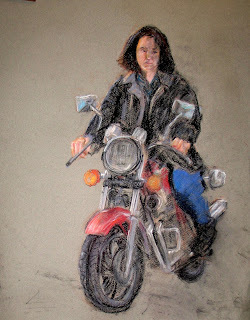 Next Wednesday night is a Long Pose and I will work in pastels on pastel paper. I can't seem to confine myself to just one medium! I used this one on my March newsletter. "Newsletter" sounds long and wordy but it actually is just one page with a picture and information about what is coming up. I call it "Loraine's Art News" and that fits as the title. (E-mail me if you want to go on my list) This is another of my City Evening series that started with the smaller "Five fifteen" of people leaving offices for the homeward dash. Then I moved to 16 by 20's with " Five forty-five" - a couple crossing the road closer to home with red lights reflecting on the pavement. This one is the dash to the eight o'clock show start. I like a lot of city lights paintings and wanted to see what I could add to the genre. Mine all involve people- no empty streets for me! Some are a bit lonelier and not all evenings are wet ones. I think they are all places we can relate to - and feel that it could be us out there. Modern cities are pretty generic now so this isn't like my series from Rome, Venice and Prague. This is definitely North America. I start each on a dark under-painting and sketch in - first with white chalk (erasable!) - and then blocking in with Zinc or Transparent White before moving in to darks that aren't done with Black plus the colours. I like acrylics because they work well for glazing so the colours- especially lighted windows and reflections on pavement- are all built up in layers for more of a depth. I'm working on a 20 x 30 one right now- but you'll have to wait to see the final result. Here is another recent one --of dried "Lunaria". Do you call it "Lunaria" or do you know it as "Honesty" ? This plant self-seeds in a dry area under the big evergreen in my front garden. It has purple flowers and heart-shaped leaves and then develops flat seed pods with brown outer walls. When they fall off, or are removed, the silvery interior walls are revealed. I wanted to capture a bit of the magical quality of this plant when dried. You can see why it is also called "Silver Dollar" plant - although I have also heard it called the "penny plant". I think you'd have to spray paint it copper to be a penny plant! Lunaria is its proper Latin plant name , no doubt because it is a bit moon-like That is what I was aiming for with the darker background and the silvery gleam. I started with a dark under-painting - although it got modified afterwards in parts. I lightly painted in the seed pods with transparent white before working in other colours and eventually some Titanium white to intensify some areas. It ended up just a bit magical after all. According to today's newspaper, teddy bears first appeared in a store window on February 15, 1903. The inventor was Morris Michtom who named his stuffed toy after the then-U.S.President Theodore Roosevelt. Teddy Bears are now a $1 billion industry in the United States. This well-worn bear would be close to 90 years old as Teddy was sent from England around 1927. It belonged to my husband and was obviously well-loved to the point where he needed patched paws and feet as well as trousers for his worn legs. I thought it would be fun to paint him with an old bank that belonged to me as a child - and then he needed some marbles to play with. I think he turned out well and shows his true personality. I painted this a short time ago - before the current "City Evenings" series, one of which was the last blog. I am still continuing them but this seemed a good day to feature Teddy. Modern bears can have quite different features and colours as well as safer eyes. I'm sure these eyes are the dangerous stick-pin eyes but I think it is fortunate that he does have the original eyes and I like the definite old-fashioned snout. The bank features columns for different coins and pictures of industriously saving children with coins and bags of money. This is the painting (16 x 20) that I have put on my February newsletter - fresh off the easel! I'm working on a series of "city nights" paintings because it is an interesting challenge . I enjoy looking at other artists' city scenes and city night scenes so I want to see what I can bring to this subject area. For mine, I prefer to be at street level - not high up- and have people in the scenes. To me. there is something a little eerie to a deserted street scene. Buildings fading into darkness have a certain mystery and I love reflections of all types. I start with a dark blue" imprimatura ", or base coat. First I sketch in the scene with transparent white, put in some of the darkest darks (no actual black was used in this) and then start building up in layers. It takes some time to build up the effects so that it becomes a painting and not a photo-copy. Sometimes people want to know just where the scene was - but I don't this this is really important - it can be anywhere the viewer visualizes it to be so that the viewer's experiences become part of the enjoyment. I'm giving this series all "time" titles so I'm calling this one "Five Forty-five" - closer to home than "Five-fifteen" when everyone as just leaving their offices. in my mind, the story is that they have bought something at the store with the unclear (deliberately) sign and are now going home with it. I know what I had them buy - and why- but someone else can bring their own story to this. What's your story? I used this painting on my December newsletter as it was in the December Men in Hats show about Harold Steves that we had in Gateway Theatre but I hadn't used it in a blog...so here it is. I wanted to show Harold out in the field with some of the Belted cattle. I have sketched Harold a few times when we have been at a meeting but, considering that he is a very busy man, this was done mostly from photo references. Some artists are very against using photographs at all for portraits. I think, for this, an artist would have to be very very well-known and the portrait would have to be commissioned. At that point, it would be easy to arrange for five or six sessions. For most of us, this is not going to happen and we are glad to be able to get a photograph of someone seen casually and then work it up into a painting, With our "long poses", we have around two and a half hours to work on a painting and then it is sometimes possible to get a photo of the model (some don't like to be photographed) so the painting can be finished at home. I have just been doing pastel or watercolour work for Long Pose so as to avoid adding more canvases to the stack - so I have not being doing additional work from a photograph, as I am finished in the length of time we have. The history of portrait painting is a long one - portraits of princesses sent to prospective husbands for one. Think of Henry VIII feeling that the portrait of Anne of Cleves was not a true one as reality was different from the flattering painting. In 17th-century Holland. social status was reinforced by portraits by prominent artists of the times. This continued with CEO's of business and important academics having portraits painted for display in their realms of influence. Then photography became better and society turned to studio photographs until that became mainstream. Then it was back to painted portraits for those who could afford it. Curators at the Art Gallery of Ontario say that a successful portrait captures "what a person wants you to know about them and what the artist sees beneath the surface." Lucien Freud was a master of letting the viewer see beneath the surface of his subjects. Brenda Bury, an outstanding Canadian portraitist, says: "Looking at the portrait the viewer should recognize a fellow human. Machines, such as cameras, don't know the difference between the living and the dead. Painters are required to." Brenda has even painted the Queen and her paintings sell for $15,000 to $30,000. 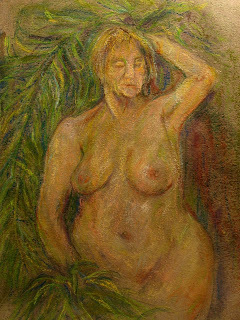 Drawings or pastels range from $3,000 to $6,000. I'd be happy to work for much less! There is something particularly interesting in the human face. I haven't heard if Harold has seen this painting but a lot of the people who viewed it at Gateway felt that it captured his personality. The other day at lunch on "studio day" we were talking about what makes a good model. Besides the obvious - holding a pose well, being able to get back into the same pose after a break and having some imagination to make an interesting pose, we also felt that there has to be some rapport with the model. There has to be an input from the model - not just sitting there like a store mannequin- so that it is a team effort, a give and take with artist and model. Last blog showed Michael who is an excellent model who even has a great chest of costumes. A few years ago, at a drawing (and painting) marathon with the theme of the "Dirty Thirties", Michael posed for two sessions. In the top painting, he is a gambler and wore a wig and mustache for this. Then he posed - standing for about 4 hours- as a Rum Runner - complete with telephone and wooden cases for the rum- and pistol tucked into his waistband! His father was a model too and his mother posed for some of the Group of Seven. Models can make a big contribution to art and artists. Michael is certainly one who is a pleasure to work with. Our "Friday" group hopes to have him back again this Spring. Labels: "Dirty Thirties" session, Michael, Rum Runner, what makes a good model? Here we are at the beginning of a new year and it is a time of sorting out paintings, wiring, re-arranging and also sorting out the records of sold paintings. I always feel that it completes the creative circle when a painting goes out into a good home. Sometimes, I hear from the owner again and they tell me that they are enjoying the painting- so I get to feel good all over again! Apparently, however, some artists don't like to sell- especially if they feel it is their best work. Robert Genn had this to say about that. "This is a career killer and needs to be neutralized with the knowledge that works of art are always yours no matter whose walls they're on - and they're best off on someone elses'." I always feel that just maybe my best work is going to be the next one anyway! "Michael" the mixed-media piece above was done on a Friday "long pose". We were asking the models to come as they see themselves. Michael is a very good model - which means that he holds the pose well and gets back into it accurately after a break- and he has an extensive collection of costumes. For this, he included a scarf that had belonged to his mother, who was also a model. 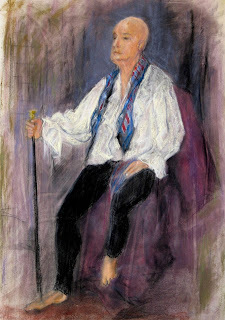 I may post a couple of older paintings from a drawing marathon with Michael posing in costume and appearing as a completely different character in another blog. My computer needs a bit of an update so I can't post the full 2016 collection of paintings on the website yet. I did put "Michael" on my Pinterest collection of Life Drawings. ... and so it is on to 2017 and more painting - maybe the best ever yet! ... A final thought- J. Bruce Wilcox, an outstanding quilter, says "Art going out into the world- changes the world."